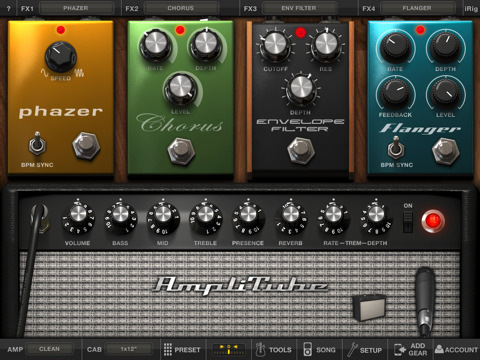 AmpliTube for iPad is a guitar amp and fx modeling software. It will turn your iPad into a virtual amp, giving you the same sound and modeling accuracy of AmpliTube's Mac/PC applications in a convenient mobile platform app. With AmpliTube for iPad, you’ll have an entire guitar and bass rig literally at your fingertips, comprising of 4 recombinable simultaneous stompbox effects, an amp-head plus cabinet and a microphone. With a fully loaded AmpliTube for iPad, you will be able to choose between 5 amps (clean, crunch, lead, metal, bass) with full controls, 11 stompbox effects (delay, fuzz, distortion, overdrive, wah, envelope filter, chorus, flanger, phaser, octave, noise filter), 5 cabinets and 2 microphones (dynamic and condenser). Plus, AmpliTube for iPad features a chromatic digital tuner and a metronome. You can also import and play with songs or backing tracks with real time effects, and create, save and recall up to 36 presets on the fly! 10 new AmpliTube Fender models available via in-app purchase (as a complete collection or as single a-la-carte models) including 5 Fender amp models — the ’65 Deluxe Reverb, the Super-Sonic, the ’65 Twin Reverb, the ’59 Bassman LTD and the Pro Junior — and 5 Fender Stompbox models — Fender Tape Echo, the Fender™ Blender™, Fender™ Phaser, Overdrive and Compressor.